Sorcha, Peader and Brian Mac Mahon were drawn into the 1916 Rising from an early age and went on to play significant roles in the emerging Irish State. On the eve on the 1916 celebrations, on 26 March, I was among the 4,000 relatives of those who participated in the Rising who gathered in the RDS to hear the President of Ireland, Michael D Higgins, give an animated address on the Insurrection. For over half an hour he drew on his considerable experience and knowledge to list and describe the social and cultural influences that led to the rebellion. The Gaelic League and GAA encouraged a language revival and sense of cultural distinctiveness. The literary movement, through theatre, poetry and music, added depth to this growing sense of national identity. On-going political debates in the nationalist media led to the establishment of Sinn Fein and the Socialist Workers Party, and sharpened ideas about the type of government desired. The dogged persistence of the Irish Republican Brotherhood kept the spirit of armed resistance alive and gathered support from abroad. It struck me at the end of this scholarly and wide-ranging talk that one key element was missing, religion. Yet it was the religious outlook of the ‘Rebels’ that determined not only holding the Rising at Easter but their attitude to life, death and what was most important. One has only to think of the incessant Rosaries offered in the GPO and elsewhere. If their faith had been based on a narrow sectarianism it might indeed deserve to be overlooked but in fact it led to a promise to protect all forms of religion and was as concerned as much about people’s material wellbeing as their spiritual. The majority of the ‘rebels’ of 1916 were fighting for an Irish-Ireland, one in which the traditional values of their country would be preserved and act as an antidote to contrary foreign influences. Their Catholic faith was pivotal to this and provided them with comfort and encouragement as they sought to cope with set-backs and disasters, and equipped them with courage and vision as they planned a better world. It was out of this religiously-inspired enthusiasm and self-sacrifice that the great missionary movement of Ireland emerged shortly after 1916. The Maynooth Mission to China (the Columbans) was founded in 1918 and the Columban Sisters in 1922. The Holy Rosary Sisters were established in 1924 and other groups were already coming together though the Kiltegan Fathers were not formally recognised until 1932, the Medical Missionaries of Mary until 1936 and the Franciscan Missionary Sisters for Africa until 1952. Over that period volunteers for the established missionary organisations also swelled. This was the fruit of a new-found confidence in their Catholic identity exemplified by the leaders of 1916 and it is a sign of how much has changed in the past 100 years that neither faith nor Christianity were mentioned in the address of the President on the energies that inspired the 1916 Rising. However, the recent celebrations have renewed interest in, and admiration for, the selfless patriotism of the 1916 leaders. It is now a challenge for missionaries to draw on that enthusiasm and help young people today to recognise the positive and life-giving nature of Christianity and a desire to share it with those who have fewer opportunities of encountering it. Columban priest Fr Hugh Mac Mahon SSC is Executive Secretary of the Irish Missionary Union. 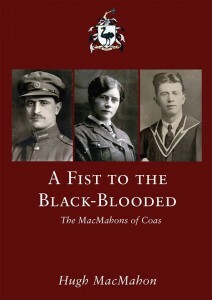 He recently published ‘A Fist to the Black Blooded’ which tells the story of three members of his Monaghan family’s involvement in 1916. 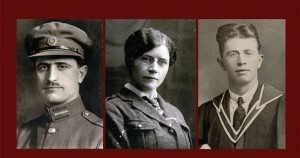 Sorcha, Peader and Brian Mac Mahon were drawn into the 1916 Rising from an early age and went on to play significant roles in the emerging Irish State.